Few things are worse than driving around with BMW AC problems. Phoenix can feel more like an oven in the summer months, and this can make driving your luxury import vehicle a lot less enjoyable. We are here to help. There is no point to driving a luxury import vehicle that can’t keep you comfortable and cool while driving. BMW AC repairs will allow you to feel comfortable while driving and restore the vehicle to its luxury vehicle status. Let us solve your BMW AC Problems and make your driving experience enjoyable once again. 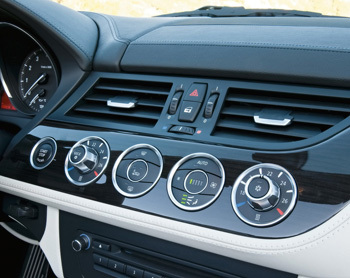 BMW air conditioning repair strikes some drivers full of dread because they are often convinced that the solution will turn out to be expensive, requiring several parts and many man hours to repair. Though every situation is different, we have discovered that the vast majority of BMW AC problems can be solved with relative ease, and at minimal cost. Even limited knowledge on how your air conditioning system works will give you a better understanding of what the cost of BMW AC repairs will amount to. For example, if your AC simply needs a Freon recharge, then you can expect the service to be quite cheap compared to if your compressor has gone bad. The trick to keeping the cost low is taking the vehicle in for A/C Maintenance before the parts wear out. Your air conditioning system can be broken up into a few components that are important to its operation. Compressor – Often thought of as the beating heart of the AC system. The compressor easily the most expensive component of your air conditioning and is tasked with regulating the pressure of the Freon gas that is cooling your vehicle. Evaporator – this is the portion of the AC system that is actually inside your cabin. Cold Freon is pumped into the evaporator and fans blow cold air into the cabin of your car. Condenser – Freon is a very interesting type of gas which changes temperature when it is under varying degrees of pressure. The condenser is what allows the Freon to make the transition from low pressure to high pressure. Interestingly enough, high pressure Freon is actually warmer than low pressure, but this is necessary to take the heat from inside your vehicle and transfer it outside the cabin. Receiver/drier – this component ensures that no moisture is allowed into the system. Moisture in your AC system will degrade its performance and cause internal issues very quickly. This is a smaller component of the system that is relatively cheap to replace. However, if the system is allowed to run with a faulty receiver/drier, it can cause significant damage to the rest of the other components. Other than that, there is an array of lines which allow these components to remain a sealed system. Replacing the lines is easy, and if a leak is discovered fixing it sooner rather than later will save you serious trouble with the rest of the system. Let’s face it. When summer rolls around, anything short of a perfectly operating Air conditioning is a serious problem. Our BMW air conditioning service will restore your vehicle to the ice box that you deserve.